The Wee Free Men: A Story of Discworld is the extremely amusing and engaging first volume of the Tiffany Aching Series by Terry Pratchett. Set in his ever-amusing Discworld (about which there are so many books one cannot keep up), this Mid-grade to Young Adult novel chronicles the adventures of Tiffany Aching, a young girl (approximately nine years old) from the Chaulk. It is funny, engaging and wonderfully enjoyable. The Chaulk and the fairy realm, both of which are part of Terry Pratchett’s Discworld. Discworld is a comic fantasy setting of a flat, well, disc shaped world, balanced on the backs of four elephants which, in turn, stand on the back of a giant turtle that swims through the universe. CRIVENS!!! I truly loved this story. Really. 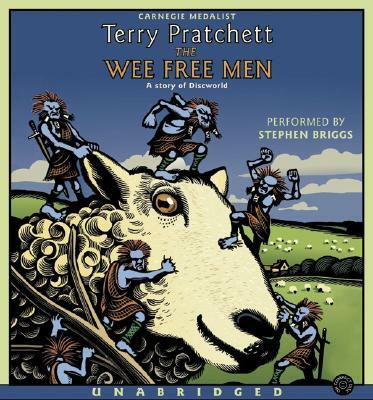 The Wee Free Men: A Story of Discworld, by Terry Pratchett, is a stand alone novel, but also serves as the first volume of the Tiffany Aching Series. It is the extremely funny and engaging story of a nine year old girl who finds herself plunged into a magical adventure of epic proportion. Along the way, she encounters the magical race of small blue men known as the Nac Mac Feegle, or Feegles for short. This translates (roughly) as Wee Free Men (as in the title of this book). They are an amusing, all but undefeatable set of comic Scots who fear only one thing: Lawyers. While in some ways the Feegles steal the show due to their ridiculous behavior, Tiffany remains the focus of this story throughout, and the proactive heroine of the tale. Indeed, one of the things I loved the best about this story is how brilliantly strong and proactive Tiffany is, while still seeming a completely believable nine-year old girl. She is at times selfish, at times remarkably giving, at times frightened and always heroic. 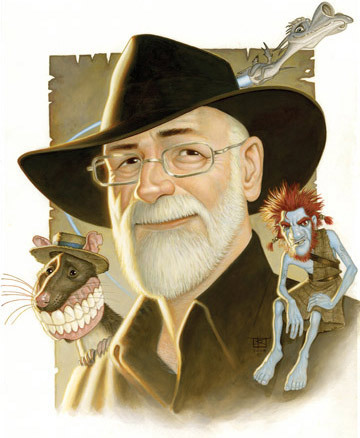 As such, Pratchett creates a brilliant role-model, particularly for young girls. She occasionally needs help, but never really needs saving. Brilliant. Yet while the target audience for this book is mid-grade to young adults, it remained equally, if not more enjoyable for me: a middle-aged man. The tale is funny, but at no point does Pratchett condescend to his heroes (even the ridiculous Feegles) or to his audience. The latter is perhaps the sign of a truly great writer of YA fiction (or any fiction for that matter): he treats his audience as if they are intelligent and capable of following complex plots. Added to this are the brilliant settings he uses. Oh, I don’t mean Discworld, which is always fun. I mean the Chaulk and the Fairy Realm. He takes well know locals, in one case real, the other imaginary, and does justice to both while making them his own. 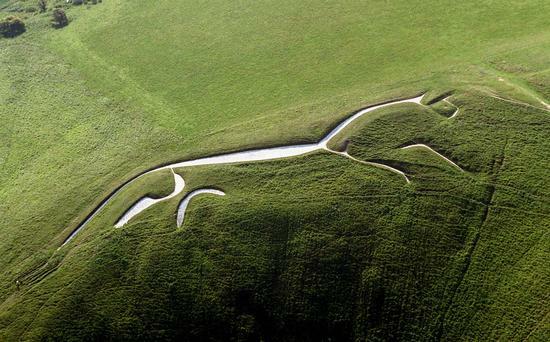 The amazing Uffington White Horse, whose remarkable environs include Uffington Castle (hillfort) and countless smaller mounds many of which can barely be detected without walking over them… one part of the inspirational setting Pratchett used as background for the Chaulk. As pointed out in the book, the Chaulk is a fictionalized version of the Chalklands of South Central England, particularly those in and around the Uffington White Horse and Pratchett’s own native Wiltshire. I spent considerable time excavating and performing landscape surveys on those windswept uplands and to me, reading his descriptions was a bit like returning to a beloved old haunt. I was at once transported to the Ridgeway as magically as Tiffany is transported to the Fairy Realm. As for the Fairy Realm, Pratchett created a half-dreamlike reality that wonderfully mirrors the Fae world described in 18th and 19th century transcriptions of folktales. It is dark and twisted, beautiful and unfulfilling. The Fairy Queen is perfectly portrayed in a manner that is uniquely Pratchett while remaining true the more recent (by that I mean 18th and 19th century) portrayals of such characters. Yet it really was the characterizations that stole the show, particularly Tiffany and that of her brother Wentworth, whose sticky screaming is exactly what I would think a nine year old sister would make of her two year old brother. For me, this is one of my favorite YA books ever, which means it is one of my favorite books ever… since a good YA book should be equally readable by anyone. Stephen Briggs does a wonderful wonderful wonderful job of narrating this book. He let’s narrative do the work, uses voices only when necessary (and crivens! They are necessary in this book) and captures Pratchett’s tone in a way that only someone who has worked closely with an author can do. Brilliant. 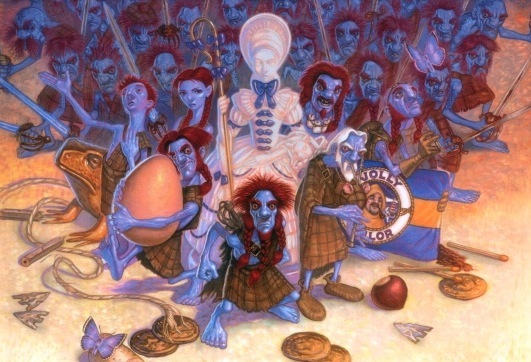 OK, in the Discworld logic they are not Scottish, but they are CLEARLY a parody of Scotsmen. In fact, while they are highly amusing, they are so stereotypically comical Scottish that one can’t help but cringe at times due to the perpetuation of stereotyping that occurs. Despite this, they are also shown as brave, heroic and loyal to a fault… so not all the stereotypes are bad. I mean, I’ve never been a nine-year-old girl, but to me Pratchett does such a remarkable job of pulling me into the mindset of one that I sometimes wonder if he had at sometime been a nine-year old girl. And boys, for that matter… but there are more positive role models for boys than girls in literature (sadly). This entry was posted in Chronicle, Comedy, Cycle, Fantasy, High Fantasy, Identity, Post Modern, Ripping Yarn, Saga, Serial, Series, Stand Alone Novel, Strong Characters, Thoughtful, Trilogy, Unique or Imaginative World, World, YA and tagged Chaulk, Discworld, Fairy Realm, Nac Mac Feegle, Stephen Briggs, Terry Pratchett, Tiffany Aching, Uffington Castle, Uffington White Horse, Wee Free Men, Young-adult fiction. Bookmark the permalink. I will have to pick it up. Midnights Children is an absolutely fabulous book. Fabulous review!!! I am biased however since the Tiffany Aching series is one of my favorites. Mine too. I like most of his stuff, but the Tiffany Aching series really captured my heart and my imagination. I truly think you were right when you said she is just so wonderfully believable. You want her to win but she does it on her own terms! Plus the Wee Free Men, I just LOVE them! Again, I don’t normally do pingbacks, but A: I got praise here, and B: I think this review compliments my won quite well (I mean as in: goes with it, rather than the more obvious says I’m great). They expected a book more geared to adults, while I expected one more geared towards kids soooooooo….